Ringo Starr was among the celebrities honoring Joe Walsh on Dec. 8 when Seattle’s Museum of Pop Culture (MoPOP) presented the guitarist with its annual Founders Award, The award is an honor given to artists who have made outstanding contributions in popular music. Pictures and video footage of the event were released Dec. 12 by the museum. Previous award recipients included Jimmy Page in 2015, Jackson Browne in 2014, Crosby, Stills and Nash in 2013, and in previous years Buddy Guy, Billy Cox, Steve Cropper, Robbie Robertson and Ann and Nancy Wilson of Heart. The annual award gala, which is also a fundraising benefit, generated nearly $1.2 million this year for MoPOP’s youth and education initiatives, which the organization said is an all-time record for donations. 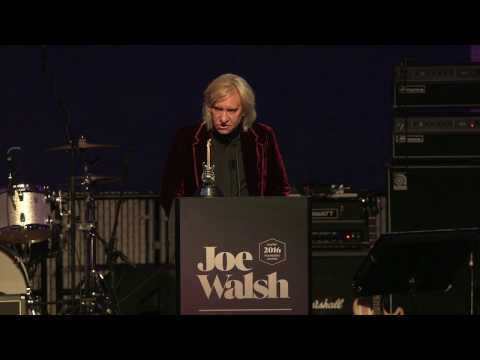 The award marked the first time Walsh has been honored for his solo work.